The following were convicted at Doncaster, Sheffield, Rotherham and Barnsley magistrates’ courts between Friday, October 2, to Friday, October 9. Assault: Danielle Ejogbamu, aged 27, of Carr Forge Mount, Owlthorpe, pleaded guilty, community order with alcohol dependency treatment requirement, £85 costs. Theft: Tina Diff, 44, of Scotia Drive, Deep Pit, 26 weeks’ jail suspended for 12 months, £20 compensation; Mehvish Akram, 21, of Headford Grove, Broomhall, community order with drug rehabilitation requirement, £10 compensation; Richard Andrews, 48, of Cammell Road, Firth Park, 20 weeks’ jail; Neil Whittaker, 40, of Owler Lane, Grimesthorpe, 12-month conditional discharge; Sophie Hunt, 25, of Spring Walk, Rotherham, pleaded guilty, three months’ jail. Drug possession: Ian Clarke, 48, of Verdon Street, Burngreave, £80 fine, £30 costs. Breach of community order: Alan Ray, 46, of Hartopp Drive, Arbourthorne, community order with drug rehabilitation activity requirement; Andrew Goulding: 23, of Northern Avenue, Deep Pit, community order with rehabilitation activity requirement, £50 costs. Drink-driving: Dominic Dallas, 21, of Spotswood Road, Gleadless Valley, 18-month driving ban; Grant Robinson, 40, of Canada Street, Pitsmoor, community order with 100 hours’ unpaid work supervised, £85 costs, two years’ driving ban; Christopher Slack, 34, of Athelstan Road, Handsworth, £200 fine, £100 costs, two years’ driving ban. Drunk and disorderly: Jamie Circuit, 25, of Brightmore Drive, Netherthorpe, nine-months conditional discharge, £30 costs. Driving without insurance: David Simons, 49, of Jefferson Avenue, Doncaster, £120 fine, £85 costs, six months’ driving ban; Eric Neale, 59, of Markham Road, Edlington, Doncaster, £275 fine, £85 costs, six penalty points on licence; Somia Sellars, 21, of Ferham Close, Rotherham, £120 fine, £50 costs; Marcus Bruce, 45, of Pontefract Road, Wombwell, Barnsley, £660 fine, £85 costs, six penalty points on licence; Jordan Cresswell, 21, of Knavesmire Avenue, Dinnington, £660 fine, £85 costs, six penalty points on licence; Ian Cunningham, 48, of Far Golden Smithies, Swinton, Rotherham, £440 fine, £85 costs; Sorin Dumitra, 26, of Lound Road, Darnall, £660 fine, £85 costs, six penalty points on licence; Nicholas Kitchen, 44, of Berners Road, Arbourthorne, £440 fine, £85 costs, six penalty points on licence. Criminal damage: Lee Wilson, 41, of Oxford Street, Crookesmoor, £180 fine, £85 costs, five penalty points on licence. Assault: Gareth Hardy, 27, of Dodworth Road, Barnsley, restraining order imposed. Attempted theft: Ricky Sellars, 35, Marshagte, Doncaster, of no fixed abode, three months’ jail, £1500 compensation; Duncan Elsey, 37, of Copley Place, Masbrough, three months’ jail, £600 compensation; Jason Grayson, 38, of Haldane Road, Eastwood, three months’ jail, £300 compensation; Shauna Dolby, 19, of Hawksworth Road, East Herringthorpe, community order, £500 compensation. Drug production: Paul Adshead, 44, of Carson Court, Rotherham, 18-month conditional discharge. Driving without insurance: John Baker, 31, of St Leonards Lane, Eastwood, £300 fine, £150 costs, six months’ driving ban. Druk and disorderly: Shane Edwards, 39, of Morrell Street, Maltby, community order with rehabilitation activity requirement, £250 compensation. Criminal damage: Marc Griffiths, 27, of Arthur Street, Rawmarsh, one weeks’ jail, restraining order imposed; Josh Brown, 26, of Main Street, Bramley, two weeks’ jail. Assault: Daniel Skitt, 27, of John Street, Great Houghton, three months’ jail; Rebecca Gott, 21, of Alan Road, Darton, community order with rehabilitation activity requirement, £150 compensation, £85 costs. Theft: Simon Cross, 30, of Pond Street, Locke Park, Barnsley, 26 weeks’ jail; Anthony Rawson, 38, of Manor Crescent, Grimethorpe, community order with rehabilitation activity requirement, £62 compensation, £85 costs. Threatening behaviour: Naomi Bennett, 28, of Mount Pleasant, Grimethorpe, two months’ jail suspended for 12 months, £85 costs; Arthur O’ Loughlin, 63, of Cobcar Street, Elsecar, three months’ jail suspended for 12 months, £85 costs; John Sennett, 34, Mount Pleasant, Grimethorpe, two months’ jail suspended for 12 months, £85 costs; Valerie Townend, 53, of Roger Road, Barnsley, two months’ jail suspended for 12 months, £85 costs. Criminal damage: Liam Fisher, 24, of Merill Road, Thurnscoe, two months’ jail. Breach of community order: Ryan Lax, 20, of Milano Rise, Darfield, £60 costs, three months’ detention suspended for 12 months; Ryan Haynes, 26, of Albert Crescent, Little Houghton, community order with seven hours’ unpaid work supervised, £75 costs; Anthony Speed, 50, of Northorpe, Gilroyd, £75 costs; Johnathan Buckley, 33, of Saville Court, Hoyland, four months’ jail suspended for 18 months; Jenny Griffiths, 23, of Nicholas Gate, Goldthorpe, £70 costs. Driving without insurance: Dominic Hayles, 28, of Springfield Road, Hoyland, £120 fine, £85 costs, six months’ driving ban. Theft: Dean Jones, 35, of Lansdown Road, Brimington, Chesterfield, 12 months’ conditional discharge, £5 compensation, £85 costs; Adam Welch, 23, of Wood Lane, Shirebrook, £50 fine, £17.70 compensation, £85 costs; Emily Teresa Wilkinson, 25, of Market Street, South Normanton, Alfreton, £85 costs, 12 months’ conditional discharge; Sarah May, 32, of Hipper Street West, Chesterfield, £40 fine, £7 compensation, £85 costs. 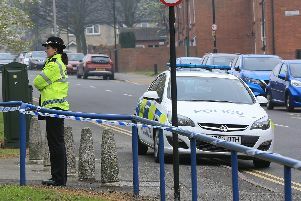 Assault: Jack Cryans, 20, of Devizes Close, Chesterfield, £50 compensation; David Hall, 31, of Wellington Street, New Whittington, 18 months’ conditional discharge with curfew requirement, restraining order imposed, £200 compensation, £620 costs; Alan Parkin, 67, of Midland Terrace, Westhouses, Alfreton, three months’ jail, £85 costs; Marcin Dzideczek, 30, of Portland Street, New Houghton, £370 fine, £400 costs; John Billington, 44, of Priestley Avenue, Stretton, Alfreton, community order with curfew requirement, restraining order imposed, £50 compensation, £85 costs. Drink-driving: Caroline Turnbull, 44, of Flamstead Avenue, Loscoe, Heanor, £120 fine, £85 costs, 12 months’ driving ban.